Whether you put your HDTV in the living room or have an entire room dedicated to your favorite entertainment, our experts can help you achieve the best possible viewing experience. Call Total Tech Repair at (631) 517-0021 to get the perfect home theater in Long Island, NY! Do you want to create the perfect home entertainment system? Let our professional installers help you with experienced home theater installation. We can help you determine the best location and position for your TV or projector, speakers, and seating to achieve the best experience. We also help you connect and organize up to eight auxiliary devices, such as DVD players, game consoles, and more so your system is functional and user-friendly. 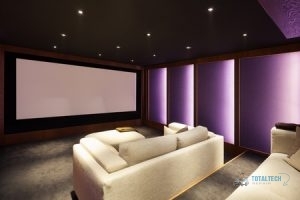 For comprehensive home theater installation in Long Island, including the following, give us a call! Get the Best Picture on Your TV: Our technicians will carefully calibrate the image as well as the sound to help you achieve the best TV picture. This is the most essential part of your home theater, so you want it to be perfect! TV Mounting: A wall-mounted TV can help save space and achieve a more modern, high-end style for your home theater. Let our professionals mount your TV to ensure it is safe, secure, and positioned properly for ideal viewing. Universal Remote Setup: If you have several remotes for your different devices, simplify your entertainment with a universal remote. Our experts will get your universal remote set up and show you how to control everything with ease! Our crew works carefully to achieve the perfect setup for you. We do what we can to hide unsightly wires, simplify operation, and improve sound and picture. No one wants to deal with slow streaming or vibrating speakers in the middle of their favorite movie! With professional home theater installation, we can make sure you can comfortably enjoy all your favorite films and more in the comfort of your own home. Call Total Tech Repair at (631) 517-0021 to achieve the perfect home theater in Long Island, NY today! Updated on April 28, 2017 at 3:41 pm by Total Tech Repair.